Cut off a piece of flax twine. Allow 18" more than the length of your bow. This twine is made of four lays or plies. Open the lays in one end for a distance of 6". Leave 3½" of twine, and open the twine again. Insert an ice pick, fair sized nail or small marlin spike so that two lays are on each side of the instrument. In this opening insert two of the opened end lays, pull them down and you will have an eye about 1¼" in diameter. Open the twine again under the insertion and pull through the first pair of lays and then the other pair so they cross each other. Continue this opening and crossing of the lays down the twine. The last two inches of the loose lays you can thin out so the crisscross splicing tapers into the body of the string. Whip the eye, and under it for a couple of inches, and wax well. This string looks like a little rope, and that is what you really are making—a small three ply rope. Eighteen threads of No. 10 Linen makes a string strong enough for the average 5'6" and 6'0" bow. Drive two nails in a board. These nails are to be 18" further apart than the length of the string you wish to make. For a 5'6" string this would be 7"; and for a 6'0" string it would be 7½". Run out 6 strands of thread between the nails. Fasten one end to a nail and twist the threads 20 to 25 times clockwise or until it begins to kink from twisting. Wax the strand well. Clip a spring clothespin on each end of the strand and put it aside. The spring clips will keep it from untwisting while you work on the other two strands. Prepare your three strands of 6 threads each, fasten them to a nail, pull them all even and carefully roll the three strands counter-clockwise. Any kinks in the strands will work out during this process. Wax well. The result should be a smooth round rope. Open six inches of this rope into three strands, and back splice an eye about l¼" in diameter. Thin out the strands so the splice flows into the rope in a neat taper. See Plate 1. 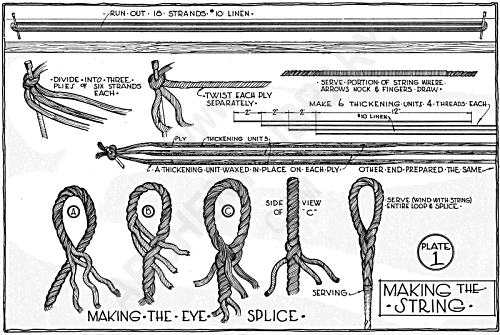 Whip the eye and the bottom of the splice. This string is made the same as the Three Ply Hand Laid String, except that it is thickened at the loop or eye and at the bottom for additional strength. Run out six threads of No. 10 Linen. Now cut off four threads each 12" long. Wax each of these 12" threads. Beginning 4" down from the nail, apply a waxed thread to the six on the nails; 6" from the nail apply and work in another; 8" down another and 10" down another. Cut off four more 12" threads and do the same to the other end of the untwisted six strands. After you have thickened both ends with the addition of these four staggered threads, wax over them. The wax is to make them stick in place. Now loosen one end of the strand and carefully twist it clockwise about twenty-five times. Prepare your other two strands the same way. Fasten the three well waxed strands to a nail, pull all even and straight and roll the three strands counter-clockwise until you have a nice little rope thickened at both ends. Eye splice your loop as described, whip it well around the eye and below it. See Plate 1. 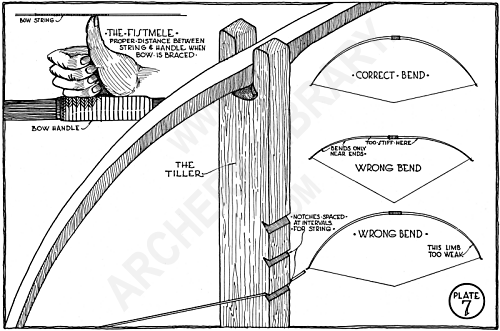 On unstrung 5'0" and 5'3" bows the loop of the bowstring should be 3" below the nock. This gives you about 6" between the string and handle when the bow is braced. It should be 3-1/2 " down for a 5'6" bow. This gives you a fist-mele of 6½". The loop should be down 4" on an unstrung 6'0" bow. This gives you 7" between string and handle when the bow is braced.